Flipping materials is generally quite profitable, and extremely simple. I did a very preliminary post on flipping in Legion that you should check out if you want a more basic approach. The essence of flipping is simple. Buy low, sell high. For materials the main way you achieve this is by buying underpriced materials in differently sized stacks. You then sell them in nice big even stacks for a mark-up. 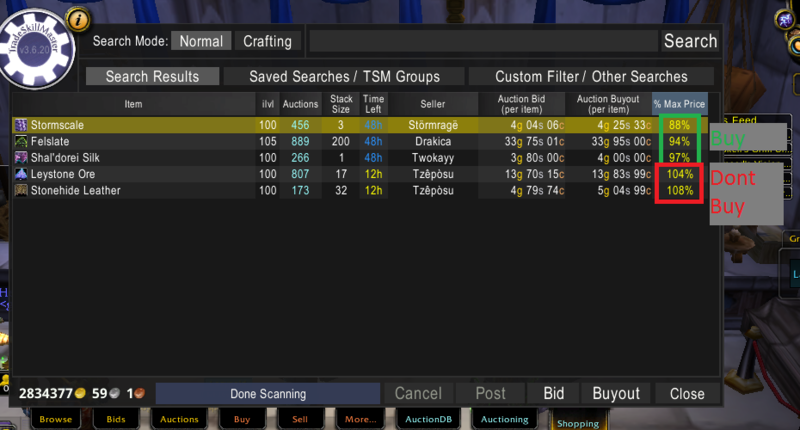 People love not clicking to much on the Auction House. So your 200 stacks will fly off the shelves. Flipping materials does not require any outside analysis. You can set it up in TSM and it will be completely automatic. I will show you how to set up and use the buying and auctioning operations I use. I have made groups for all tradeskills split up by material type. You can use them for buying for your crafting needs or for flipping the tradeskills. My TSM group import data can be found on my Pastebin. When you import the groups they will look like this. This is how my Legion materials TSM group looks like. The group is pre-set with the same shopping and auctioning operations for all materials. 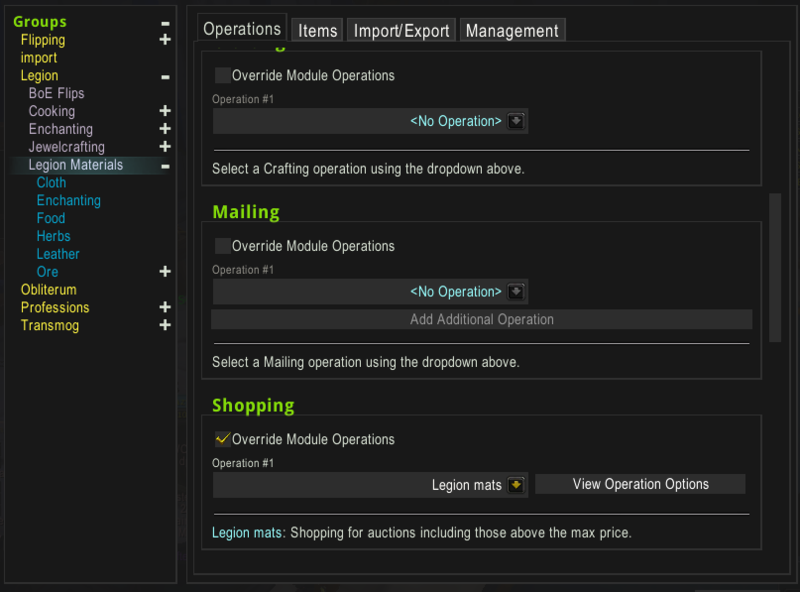 For the materials that you use for crafting you will most likely want to remove the auctioning operation and add a mailing operation to point to your crafter. Mailing operations are very easy to set up. Just click the checkmark “Override module operations” for the group you want to add a mailing operation to. Then click the new “Create new operation” button that appears. This should take you to the screen for naming your operation. I name all my mailing operations for the character it sends the items to. Then you get to the operation settings. You only need to write the character name in the target player box and you’re finished. This operation will send all items in the designated group to the named character, but that is more than enough for mass crafting. After you have created the operations it will appear in the drop down list when clicking override module operations and you can just add it to other groups as needed. The group includes two shopping operations. One that is designed for flipping and one that is designed for mass-buying to craft. You should go through the groups and assign the right operations as needed based on what you are crafting and what you want to flip. In the pastebin the flipping operation is added to the cloth group by default. The shopping operation for flipping has a max price of 70% dbmarket. The operation by default shows auctions above the max price as well. In general you will want to buy everything below 100% maxprice. The included auctioning operation for materials sells the materials for minimum 100% dbmarket in stacks of 200. The operation will only undercut other 200 stacks as you are not competing with smaller stack sizes. This guarantees a profit of about 30% for flipping materials. You will just run the auctioning operation whenever you have materials. These operations are completely plug and play. I have not used the auctioning operations for all trade goods, so you might want to experiment with the stack sizing. Some examples are 20, 50 or 100 which all could work well. This operation sets the maximum price to 100% dbmarket. This is the same as the maximum price for most materials in TSM crafting. 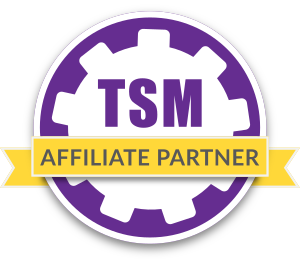 If you buy up to 100% you know you will be profitable if TSM crafting shows a profit. You might want to adjust this down or adjust your shopping patterns depending on the server. On my server for instance i generally find that shal’dorei silk is much cheaper than Stonehide Leather. I can turn them both into Leylight Shards in the same ratio so I will buy Shal’dorei Silk at prices above dbmarket as long as I know I can profitably turn it into Leylight. You will have to be the judge on what works for you. In general you will be less bound by the max price here. I generally rely on my spreadsheet to know the price thresholds for the various materials I buy for crafting. Great write up, and good read. It was very informative and gave me some insight into the world of new content trade goods. I just got started into being a goblin and trying this AH out after 8 years. I was wondering how do you combat the constant undercutting of your trade good auctions. It seems like always there is someone selling @ 60% – 70% market price, and I am still posting at 100% market price. Any tips or hints to combat some what? No it isn’t “plug and play”. I put the group in and it says “Nothing to search for” every time I click start search with the groups selected. I updated the groups to make sure they include a shopping operation. Please importing them again and see if that resolves the problem. TSM imports can sometimes partially fail as well and that will usually mean that only empty groups are imported with no items in them. This can usually be fixed by reloading the UI with /reload and then trying again. 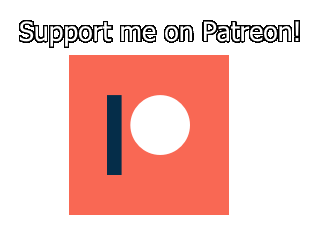 Please let me know if this works! do you have any thing writen in / options / shopping? at market value pricew Source and below custom prise? There is some art to flipping, as you need to look at the AH to see if you can reasonably resell the items dast enough. When flipping you should never invest more than you can handle losing, especially when starting out. That being said prices arr lowest and supply is highest during the weekend and this fluctuates quite a bit over time so don’t give up yet. The most important part of flipping is to buy cheaply, worst case you can usually atleast recoup 90%.